Just as we were moving into Google Campus two years ago we met two guys with an interesting idea. They’d been giving unemployed teenagers £100 and space on a market stall in Greenwich to see what would happen. They even had a pun as a name (we love a good pun). It was called Meet Market. Although we couldn’t invest because it wasn’t really ‘tech’ enough for us, we did offer them a couple of desks and some advice. 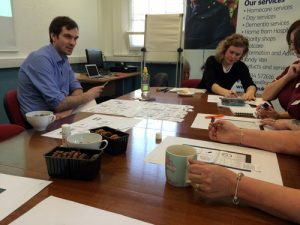 But events quickly overtook us and Joe and Tom ended up moving on to bigger and better things – not just getting young people into business but helping them learn about digital manufacturing as well. Fast forward to 2014 and Joe and Tom have been joined by Paul and Andy and now run Makerversity in the vaults and tunnels beneath Somerset House right next to Waterloo Bridge in London. It’s quickly filling up with interesting makers and startups including BGV alumni Good Gym (also lovers of a good pun). 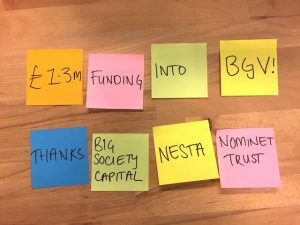 We’re very pleased to announce that, following a very happy year at Nesta, Makerversity will be BGV’s new home. So if you join us for our Summer programme you’ll get six months desk space and membership. 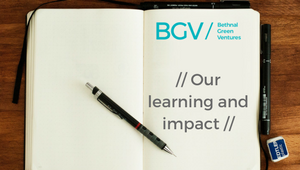 We’re also going to be joined by some other ‘tech for good’ investors, hopefully building a real hub for people using tech to address social and environmental problems.